Recombinant monoclonal antibody to CD52. Manufactured using AbAb’s Recombinant Platform with variable regions (i.e. specificity) from the hybridoma YTH 34.5-G2b (Campath-1G). Specificity: Human CD52 antigen, also known as CAMPATH-1. CD52 is expressed at high density by lymphocytes, monocytes, eosinophils, thymocytes and macrophages. It is expressed by most lymphoid derived malignancies, although expression on myeloma cells is variable. Note on publication: Describes the generation and characterization of this antibody, including its T-cell depleting function. 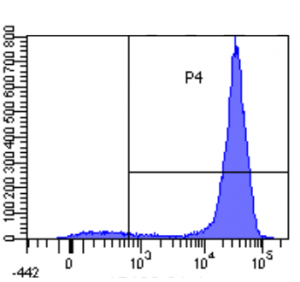 Flow-cytometry on human lymphocytes using Ab00165. 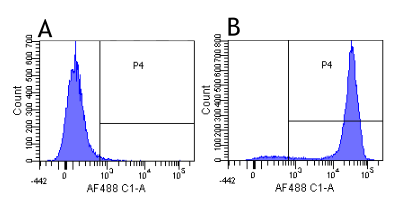 Flow-cytometry using the anti-CD52 research biosimilar antibody Campath-1G (YTH 34.5-G2b, Ab00165) Human lymphocytes were stained with an isotype control (Ab00102-23.0, panel A) or the rabbit-chimeric version of Campath-1G / YTH 34.5-G2b (Ab00165-23.0, panel B) at a concentration of 0.25 µg/ml for 30 mins at RT. After washing, bound antibody was detected using a AF488 conjugated donkey anti-rabbit antibody (ab150073) and cells analysed on a FACSCanto flow-cytometer. WB on mouse spleen using Ab00165. 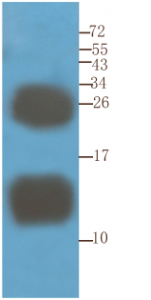 Western Blot using anti-CD52 antibody YTH 34.5-G2b (Campath-1G)(Ab00165) Mouse spleen samples were resolved on a 15% SDS PAGE gel and blots probed with the rat IgG1-chimeric version of YTH 34.5-G2b (Ab00165-8.1) at 1.5 µg/ml before detection using an anti-rat secondary antibody. Protein was detected by chemiluminescence. The expected unmodified running size for CD52 is ~8kDa, but this protein is extensively glycosylated and exhibits running sizes of ~11-25kDa. Ab00165-8.1 successfully detected CD52 in mouse spleen samples.